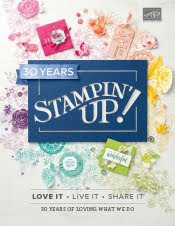 Just Julie B's Stampin' Space: Pretty Pines Note Card Set! Whew! Hopefully your holiday crafting is done or nearly done. Now, it’s time to think about what comes next. Thank you notes and other small gifts for visiting can always come in handy! 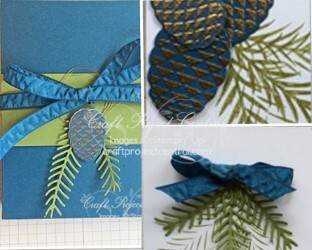 This note card set has crisp, clean and simple lines which can be a welcome change from the excesses of the holidays. Enjoy this set of cards and its cute box for your own use or make several to have on hand to share as you drop by and make visits with friends this winter. This pretty project was made by Sara Levin and you can get her tutorial when you subscribe to the month of December over at Craft Project Central.